AMODIT is used by banks and financial institutions. There are various business processes that can be implemented. Some of them are general like Cost acceptance or Vacation requests and some are industry specific. Below you can find selected examples of such processes. There is lots of operations that require communication between departments. This communication has to be precise, traceable and effortless at the same time. This is very important because of legal and audit requirements. All changes has to be stored with timestamp and information about employees involved. Usually these processes involve front-end departments (who communicate with customers) and back-end departments (who have access to core systems). Each request has to be verified by 2 separate people (4-eyes rule). The most simple process can look like that. 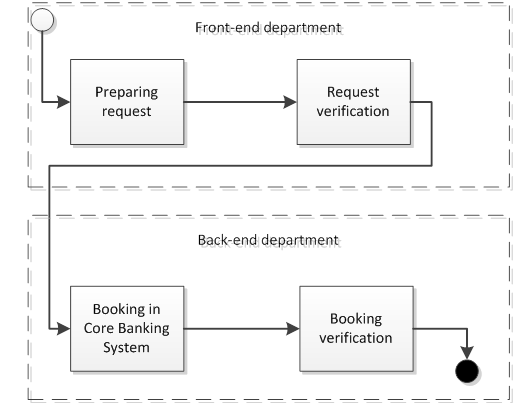 Process is usually initiated by front-end department and then executed by back-end department in core systems. Dictionaries (like accounts, customers Ids, internal accounts, loro accounts, nostro accounts) are imported from core systems to make it easier for users to enter data. It minimizes risk of mistakes. 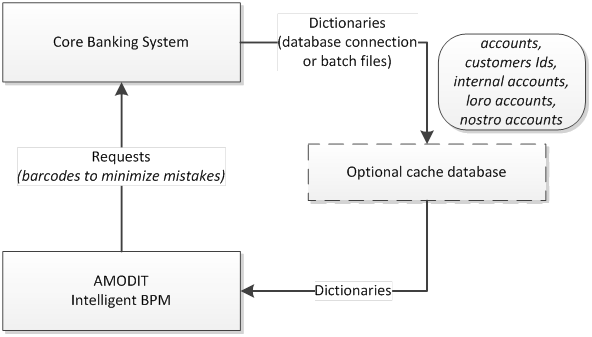 These dictionary data can be takes from core system by database request or by batch files importing. Additional help is given when entering data to core systems. Those systems often use old-fashioned technologies (like COBOL) and are not easy to make integration with. Therefore AMODIT gives ability to generate barcodes with any necessary data which can then be easily entered barcode reader. This also minimizes risk of mistakes and saves time. This process is used to request and execute changes in banking IT systems. Whenever business requires to make changes to IT system it has to be approved and executed by several departments. This process can take time and it is important for business users to be able to track progress of the process and its current state. Why AMODIT is so special? You can imagine lots of other business processes. Need for new type of process can suddenly because of changing business environment. So this is important to have ability to define them very quickly by business users. It is also important to be able to redefine them on the fly. AMODIT gives business users ability to suggest new processes and use them immediately. AMODIT uses artificial intelligence to analyse flow of information and detect bottlenecks. It helps discovering new processes and redefining existing ones.